Take on variable, challenging conditions with the proper gear. Fischer's waterproof Triple-F Membrane with a waterproof zipper is a great start. Add an easily adjustable cuff, leather upper, and a stable molded heel cap to stay dry, warm, and still be agile. No-slip Vibram® N75 sole for safe walking. Comfort Guard: Very lightweight, water-repelling insulation material for additional thermal protection in the forefoot and toe area. Inside the boot, a light, thin layer of water-repellent insulation material offers additional thermal protection in the forefoot and toe area to keep skiers warm as they glide through the snow. Easy Entry Loops: Practical entry loops and wide-opening designs guarantee that boots can be put on/taken off comfortably. Fischer Fresh: Fischer Fresh puts an end to unpleasant odors, giving you lasting freshness inside the cross-country skiing boot with a pleasant smell and feeling inside. Heel Fit Strap: Enables individual heel width setting. Gives you optimum hold and heel fit inside the boot. Hinged Polymer Cuff: Ergonomic molded cuff for remarkable side hold with good freedom of movement to the front and back. Easy to adjust with Velcro fastener. Canting and EVA padding depending on model. Injected Exterior Heel Cap: Good heel cradling and robust protection all in one: exterior heel cap for even better power transfer. Integrated Gaiter: Integrated, easily adjustable gaiter for optimum protection in deep snow. Waterproof lightweight material and sealed zip for maximum cross-country skiing enjoyment, even in untracked terrain. Lace Cover: Lace covers for additional protection against the snow and wet conditions and to give you a comfortable warm feeling. Leather Upper: Natural upper material made of real leather that has been treated a number of times. Follow enclosed care instructions. Sealed Zipper: The specially sealed zipper system ensures that any moisture is kept out. Sport Fit Concept: The right fit for all requirements. Whether it's shaped for the female foot with the comfort or race version, customized for the feet of young skiers, meeting the comfort requirements of all-rounders or for direct power transfer in racing, the Boot Fit Concept with special lasts is the answer to all the different needs and morphologies of the various consumer groups. 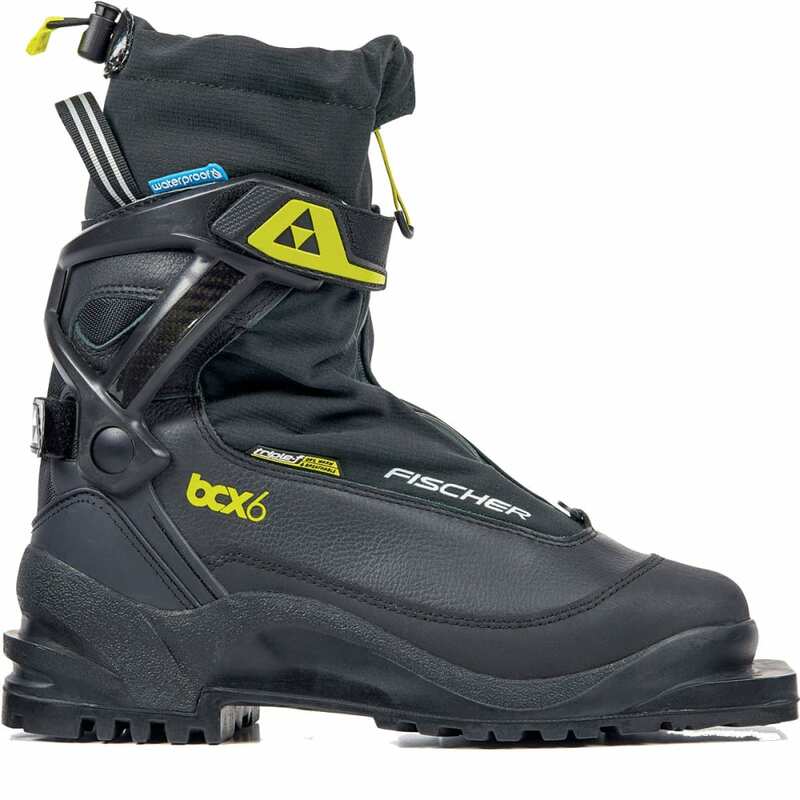 Triple F Membrane: Special membrane ensures that conditions inside the boot are perfect: dry, warm and breathable. Waterproof: For Nordic skiers who value total moisture protection and warmth above all else, Fischer has backcountry boots with integrated gaiters and fully waterproof construction for dry feet on even the wettest, coldest days. Velcro Strap: Fastening element for cuffs and instep straps, easy to handle and adjust. Avg. Weight (pair): 2 lbs., 5 oz.